We were timid. My sister and I. We hid when the doorbell rang. I remember hiding behind this large tropical potted plant in the entrance frozen with fear. My sister looked over at me as if it were just a game of hide and seek. There were a lot of fears in being a small boy living in Southern California. At night while in bed, trying not to wet my pants but too bloated to walk to the bathroom, I sat as still as a sardine while the spotlight of patrolling helicopters hovered above. The light canvassed are yard like a flash from Heaven, revealing my death and birth in a moment of delirium. My parents were new at being parents and our home was small, lodged in between avocado and orange trees and nestled between a busy side street and a mysteriously dark alleyway. The alleyway held all my dark and fearful creations that didn’t exist. After dark, the alleyway was off limits and was shut out by the light from inside over the dinner table. I had just started Kindergarten and don’t recall anything out of the ordinary except for Parade day. Since everything my parents did for my sister and I was sheltering us from harm, this inevitably bled over to the sheltering of the realities of regular life. There was a parade happening by my school one day and the teachers thought it would be fun to run out and watch it. I stood next to a girl, probably the first unrelated girl I had been near, and awaited the horns and drums and the pumped up cheerleaders. I remember looking over at the girl a lot and she would smile. In my mind, we were already friends and maybe more. The band approached and in slow motion my cool demeanor for the girl turned into absolute fear of the sound of the cracking snare drums. It was like firecrackers in tin cans. I watched her face turn from a smile of the best sweetness of smiles to this look of concern and worry. I was letting her down, dropping the ball on my confidence and pride and wrecking our courtship. I let it all loose as if being defiant with my full bladder at night and realizing there was no hope for a bathroom visit and just letting go. Isn’t everything letting go, restoring the damages and delusions of youth at an older age? I was crying and the snare drums and bass drums were pounding and no one noticed anything wrong, especially tears coming from a little face in a crowd. But the girl did and eventually the teachers did. 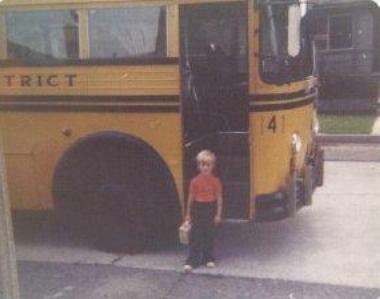 One day after school, I got onto the large school bus that took us home. I noticed the driver was not the same laughing potbelly guy. I walked past him without saying anything. As the bus route unfolded, the little occupants became few and less. I was getting to be the last one. The driver was talking but I couldn’t hear, so I walked all the way up the shiny dark blue linoleum aisle. The large glass bulb lights on his dashboard mesmerized me. I loved little lights that indicated something I didn’t understand. I finally realized that the bus driver was asking where I lived. I was only five and had trouble at first formulating a verbal map for the potbelly-less, unlaughing new driver. After a few minutes of not knowing how to speak for myself, I finally sprouted a knowledge, a wealth of unused words that the driver could understand. I saw my words change his facial expression and move his eyebrows like slot machine numbers. I was doing something to him with my words. The bus began to get onto familiar streets and I got increasingly excited. I spoke faster as the driver drove faster and soon there was the corner where I scraped my knee really bad and then the dark and mysterious alleyway, which wasn’t mysterious at all during the day, just two stupid garbage cans and my life became clear as the air breaks of the bus hissed and the bus driver finally smiled and I smiled and I thanked him and we were now friends and I walked through the front door of our house which I never did and felt hungry and alive.